The review is written by Jon Wright for the Twentieth Century Society Journal. This wonderful book is the culmination of a two year study funded by the Arts and Humanities Research Council into the extent and significance of art as an integral part of the built environment of schools. Using examples from around the world, it looks at how artists, architects and educators collaborated in the C20 to create unique works of art. It’s a timely reminder of an overlooked bit of design history and material culture which still has important implications for how we make and view art, not just in schools, but in the wider public sphere. In that sense, it can be read as powerful testimony for paternalism in public art. Our book, The Decorated School. Essays on the Visual Culture of Schooling is now published and available via the Black Dog website. Use the following link to place your orders. New Book published soon ! The Decorated School. Essays on the Visual Culture of Schooling is soon to be published by Black Dog. Contributors have been participants in the research network. The book is beautifully illustrated and contains chapters with examples from England, Scotland, Norther Ireland, France, the USA, Japan and Kyrgystan. It has been funded with help from the Arts and Humanities Research Council and a generous grant from the Henry Moore Institute. Order your copies now ! 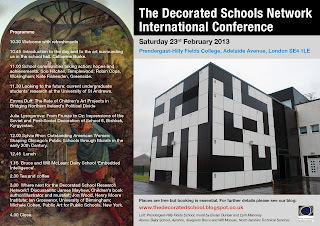 Subjects include: the ‘Art at School’ movement in France; sculpture in Japanese schools, the Chicago mural movement; the Edinburgh ‘Schools Beautiful’ programme; the art-curriculum relationships of post-war British primary schools; London County Council’s educational commissions; Asger Jorn’s Decorations for Århus Statsgymnasium; abstraction and modern schooling in New York; Soviet and Post-Soviet school decoration in Bishkek, Kyrgyzstan; and children’s art projects in Belfast. The Arts and Humanities Research Council funding of the Decorated School Research Network came to an end in February this year. There is scope now to put together an international research project drawing from the enormous interest that this blog has raised around the world. Please get in touch if you are interested in helping to shape the next stages of the research which can focus on looking more closely at how pupils and teachers respond over time to elements of decoration and colour in their school buildings. 122, 484, P4, 284 all stop on Adelaide Avenue close to the school. The artist Robin Tanner (1904-1988) taught at Ivy Lane Elementary School, Wiltshire between 1929-1935. 'Robin's classroom had four murals of the seasons on the walls: they weren't complete murals, but rather large pictures, and had been executed directly on the plaster'. These had been carried out by the children under Tanner's guidance. The school has formally recognised the significance of these years by means of a blue plaque on the school wall. There is evidence that the school keeps the tradition of mural painting alive. See 'Art and Craft: Marion Richardson and Robin Tanner' in Adventures in Education by Willem van der Eyken and Barry Turner, Penguin Press, 1969. 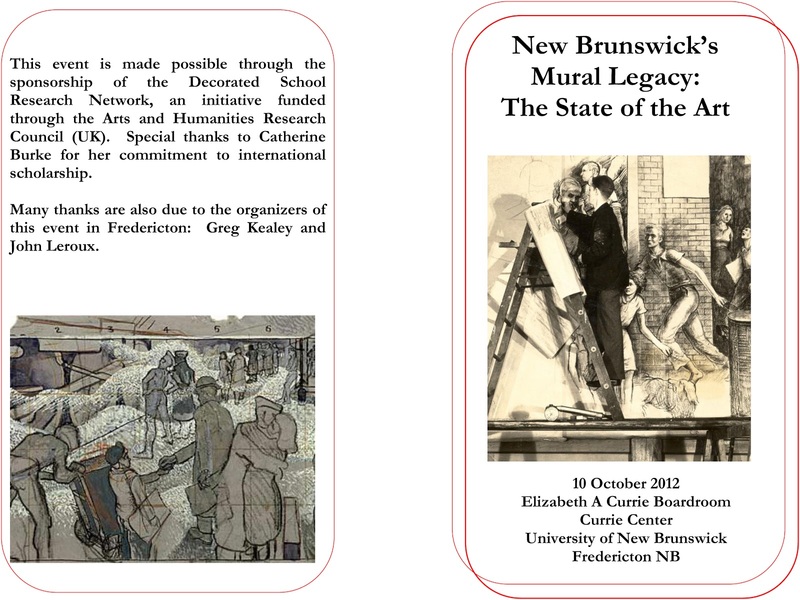 On 10 October, 2012, the Decorated School Network sponsored a symposium in Fredericton, New Brunswick, Canada entitled “New Brunswick’s Mural Legacy: The State of the Art.” The symposium took place on the campus of the University of New Brunswick in a new building, the Currie Center, that houses a mural with a story of interest to Decorated School researchers. The mural is a re-creation of a mural commissioned in 1946 as a war memorial commemorating the war-dead of the province’s largest secondary school, Fredericton High School. The artist, Fred Ross, who went on to a very successful career as an easel painter, was himself a recent high-school graduate and an aspiring professional muralist. The mural, entitled The Destruction of the World Through War/Rebuilding the World Through Education, took Ross two years to complete and when unveiled, with much solemn ceremony at a well-publicized event in 1948, was the largest work of its kind in Canada. Though the officials who spoke at the unveiling suggested the mural would serve as a reminder of the human costs of war for all time, in fact the mural only hung on the school’s auditorium walls for six years. It was removed when the building was being renovated in 1954, lost, found (in damaged condition), lost again, found again, and lost for what seems to have been the final time in sometime in the early 1970s (this history was retold by local historian and artist John Leroux at the symposium). A combination of circumstances led to the re-creation of the mural in the Currie Center where it was unveiled in June of 2011. These included the fact that Fred Ross, though an octogenarian, was still a working artist able and willing to supervise the project; that the University was supportive, had the perfect space, and a sympathetic and generous private patron willing to help fund the re-creation; and, finally and very significantly, that a network of local artists, activists, and scholars had kept the memory of the mural (and its destruction) alive and helped push for this kind of restorative action. Considering the work the Decorated School Network has been doing, the Currie Center was an appropriate venue for a symposium it supported to promote international scholarly cooperation. All of the participants spent time viewing the re-created mural and it usefully raised issues that came up again and again in our discussions. What makes a work of art in a public space meaningful? How can such meaning, or value, be sustained for users of the space over time? Which works, or kinds of works, get preserved (or in this case, re-created) and why? These were the kind of questions addressed by Catherine Burke in her opening remarks to the symposium: “The Decorated School: An interdisciplinary research network.” Professor Burke, who spoke via video-link from Sweden, described the progress of the Decorated School network’s research to date, some of the key recurrent ideas and themes relevant to art in U. K. schools both past and present, and called for continued international collaboration and research. The next speaker, Sylvia Rhor of Carlow University, provided a brief overview of the vast early 20th century mural collection in Chicago's public schools and the recent preservation of these works. In particular, Rhor focused on the circumstances surrounding the censorship of Edward Millman's mural at Lucy Flower Technical High School (1941). The whitewash covering this mural has now been removed and Rhor insightfully analyzed why, in form and content, Millman’s depiction of significant historical women was deemed inappropriate to be seen by the female students in the vocational school. The international context provided by Burke and Rhor usefully framed the rest of the day’s discussion of the most notable decorations in New Brunswick schools: modern murals produced between the 1930s and the 1950s. In this period – influenced by mural movements in Mexico and the United States – New Brunswick artists produced a remarkable number of murals in public spaces. Many were in schools, but the symposium also discussed murals prepared for hospitals and universities. As one participant noted, what the murals shared was an “institutional audience” – they were designed for spaces which people visited for purposes other than contemplating art. This might begin to explain why only a few of the murals of this era have survived in their original settings. The symposium brought together historians, curators, conservators, local artists and heritage activists and the papers and informal discussion prompted considerable thought about how these works can be interpreted in the present, preserved, and seen in relationship to one another and to the broader international context discussed by Rohr and Burke. 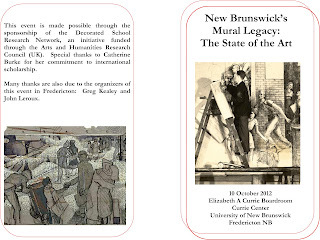 Formal papers were delivered Leroux and Kirk Niergarth, a historian at Mount Royal University in Calgary, Alberta, on the murals of Fred Ross and, in particular, the circumstances that led to the destruction and re-creation of the Fredericton High School war memorial mural. Representatives from the New Brunswick Museum discussed murals prepared for hospitals by New Brunswick artist Miller Brittain. Conservators Claire Titus and Jeanne Beaudry Tardif described their efforts to preserve the eleven enormous, full-scale cartoons Brittain prepared for a mural in the Saint John Tuberculosis Hospital. This mural project was cancelled, but the cartoons themselves have been called the most important social realist work ever produced in Canada. Because the images are unwieldy and fragile, they have been very rarely exhibited. Titus and Beaudry’s efforts, allowing the public to access the space in which they have been working at the New Brunswick Museum have brought the cartoons back to public attention and have prompted discussions about creating the conditions for more permanent display. Peter Larocque, curator at the Museum, gave a paper recounting the peripatetic history of a later mural Brittain executed in Saint John’s Veteran’s Hospital. This mural, like Ross’, depicted the horror of war and the promise of peace. When it moved from its original setting to, first, a retirement home and then the Saint John General hospital, the mural attracted complaints from those who objected to what they perceived as disturbing subject matter. At one point, hospital employees circulating a petition calling for the murals removal. Now the mural has found a home in the New Brunswick Museum and Larocque tried to explain what made the mural a difficult one with which to live. The theme of hiding murals from view – whether through censorship in Millman’s case, neglect in Ross’ case, lack of continued patron support in Brittain’s early mural or in response to complaints in the case of his later one Brittain’s later one – was a repeated refrain in the symposium. Gemey Kelly, curator at the Owens Art Gallery in Sackville New Brunswick, discussed the murals in Sackville by Alex Colville. Colville was trained and worked at Mount Allison University in this small New Brunswick community and executed three murals there. The first was a student project (now destroyed), depicting a railway scene in the community during the Second World War. The second, executed while Colville was a faculty member, depicted the history of Mount Allison through a series of images. The final mural, of athletics, is closest to Colville’s mature style as a highly successful easel painter. Kelly displayed the many preliminary drawings owned by the Owens gallery that illustrate Colville’s process and evolution as a mural painter. 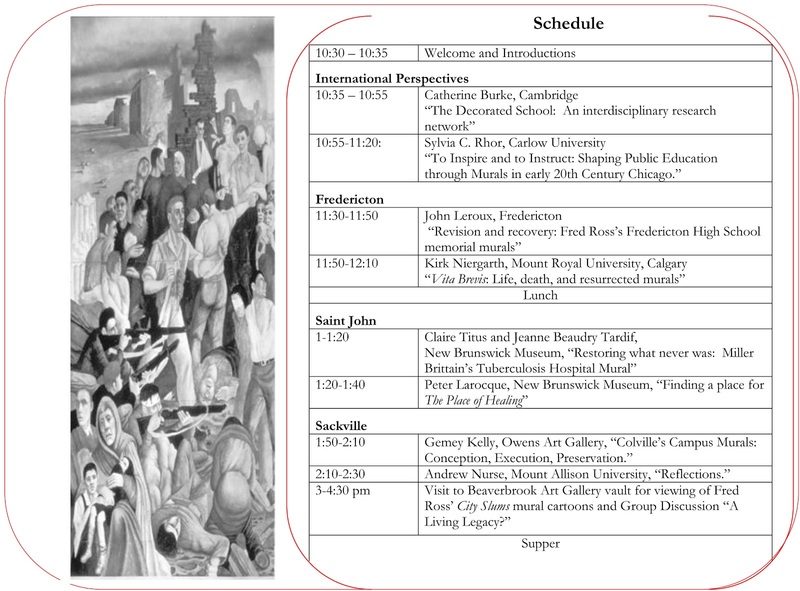 After the presentations, symposium participants were afforded a visit to the vault of the Beaverbrook Art Gallery in Fredericton for a special viewing of the rarely displayed cartoons for Fred Ross’ mural City Slums, which was painted (and survives) in the Saint John Vocational School. This concluded the day’s events, but participants have subsequently become involved in two publication projects. 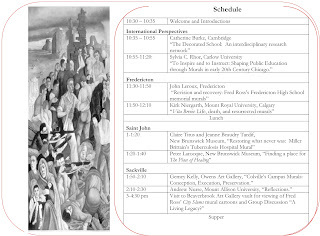 The journal Acadiensis (the journal of the history of the Atlantic region) has invited participants to publish short versions of their papers in a “Forum.” And several of the participants have been invited by the editor of the journal Labour/Le Travail (journal of Canadian Labour Studies) to make submissions comparing the Canadian and American history of murals in Vocational Schools. These publications will certainly acknowledge the Decorated Schools Network. All attendees of the symposium owe the Decorated Schools Network a debt of gratitude for providing the impetus and the opportunity to participate in such a stimulating and fruitful scholarly event. We are researching the relationships between architects, artists and educators through the art which became part of the fabric of school buildings and their immediate environments in the 20th century. We are interested in understanding more about how the art came to be commissioned, how the subject matter was decided, what was its function, its life story and what ideas about education or childhood, if any, were intended to be conveyed. The research is funded by the Arts and Humanites Research Council and is led by Dr Catherine Burke, Faculty of Education, University of Cambridge and Dr Jeremy Howard, Art History, University of St Andrews. There will be 4 seminars, open to the public, at sites of significant interest over the next 2 years as well as a final international conference and book. We will use this site to announce events, collect material and report on findings. Do contact us to let us know of any school based murals, ceramics, textiles, sculptures by recognised artists - possibly in collaboration with school pupils - that you know exist. Many of these may be in danger as school buildings are becoming replaced often with scant regard to the treasures that they contain. Professeur Annie Renonciat, visual education historian, Institut National de Recherche Pédagogique and Université Paris, France.